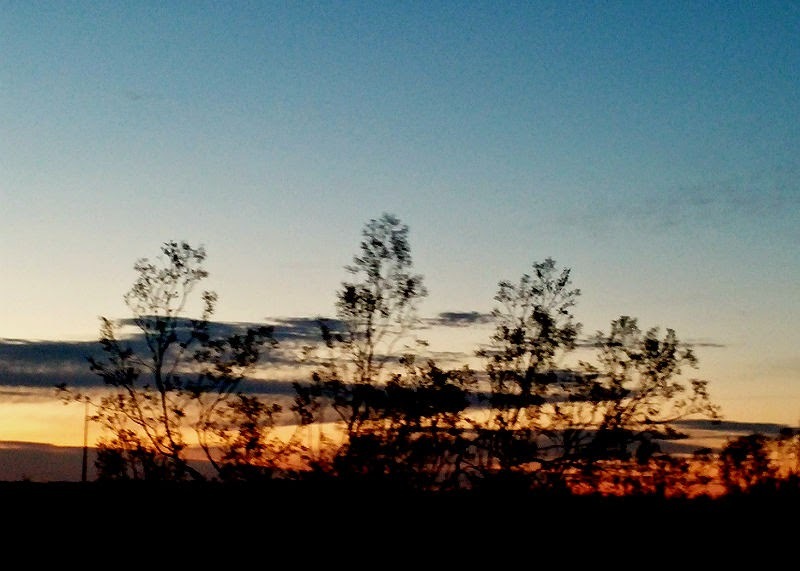 I’m very fond of the creosote trees. Our house is ringed with about a dozen lovely deep green specimens, and beyond this ring exist the smaller and yellowed foot soldiers that populate the mesa floor. Creosote trees that ring houses and edge the roadways, on sandy banks, and other areas disturbed by humans, thrive and seem to respond to the human need to observe and describe. They offer in big print and simple pictures the processes the plants employ to survive in an arid and ovenish environment. When I first laid eyes upon the mesa I saw a wasteland of indistinguishable and oversized weeds, acres and hectares of creosote, a plant no one cared enough about to give a better name. 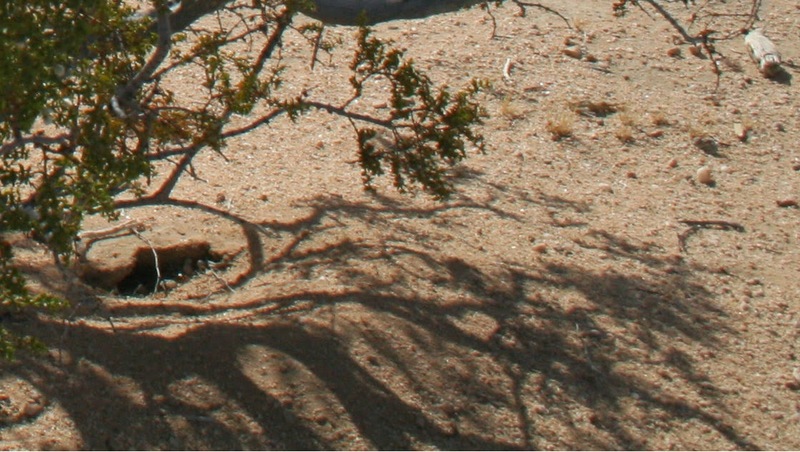 I thought there must be many species of creosote because I noticed that two trees next to each other could look completely different. 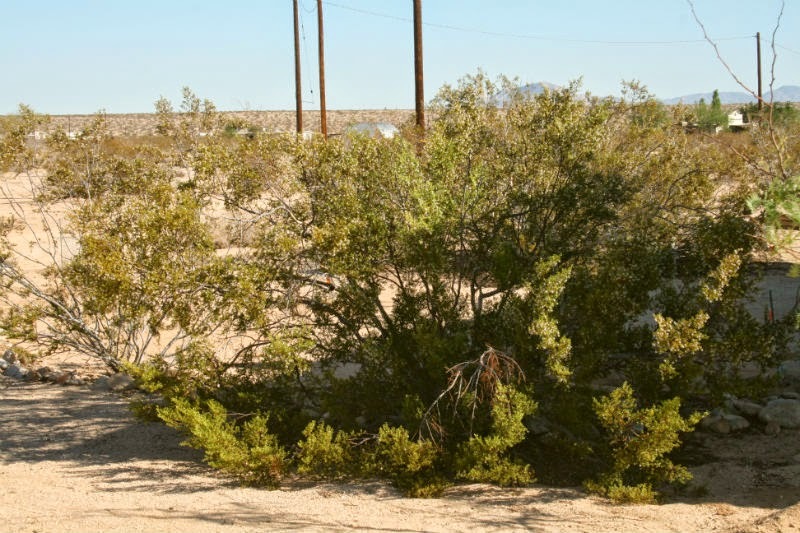 Still today, knowing as I do that there is only one species in the Mojave, I swear that near our cabin, one tree among all the others testifies to there once being a red-headed mailman who rode his pony out this far. It doesn’t look like any of the other plants. It looks like another species entirely. The first larrea tree that I loved I named Terpsichore, after the muse of dance. She is about 12 feet tall and has three main branches with many lacy fingers that reach up and sway and frame the sunrise. I love her most because she taught me that larreas share with cats the ability to extract from sameness a limitless variety of personalities. Of course I realize that in saying such things I am applying human conceits to something that exists in nature, that existed before me and will exist after me, swallowing up my observations, with no care as to whether I call it creosote or larrea or shoegoi. But this is how we humans understand, by mapping to the vagaries of nature and creating analogies, and if this analogous imagining can prevent the blading of one acre of mesa then the mapping, however poor and limited and inaccurate, will have been worth it. Terpsichore digs swales beneath her canopy which makes her a permaculturalist. Her broken and fallen outer branches, alive or dead, are raked back and forth across the ground, day after day by the fierce winds that rip across the mesa. The tiniest and most delicate branch can dig a swale four inches or more across, a foot or more in length and three inches or more in depth. In the dry season these swales catch seeds attracting small animals and insects, acting as feeding troughs. Some of these animals tunnel through the softer earth in the swale – where the desert crust has already been broken. In the wet seasons the swales draw water off the washes and stringers and divert it to the roots of the plant. Seriously ingenious. Notice the little branch in the front left that curves back up into a sprig of leaves. This little branch dug this swale. One of my other favorite larreas I’ve named Melpomene, for the muse of tragedy. She has an upright aspect but each branch takes a circuitous route, creating elegant and graceful curves and their generous spacing creates an almost diaphanous affect. The branches reach up to the sky dramatically and because they are so thin they curve back downwards under the weight of their trichomes, which hang and sway like pearl earrings. Because her aspect is upright she cannot hold the detritus that would build community beneath her roots and nourish her. She has no hips – she springs from flat ground scrubbed clean by wind and sand. Recently, though, I noticed a fair-sized hole beneath her, about three inches across, housing some kind of creature with powerful hind legs that kicked the dirt out in a mound behind it. Some people theorize that the mounds, the hips, on which many creosote sit are caused by the wind blowing sand up against the crown. I might accept that but the wind on the mesa comes mostly from the west, so if that were the explanation the mounds would be larger on that side and in actuality they are very even all around. I believe that in addition to the wind the mounds are caused by animals that dig down among the roots of the larrea, pushing dirt up under the canopy. You can see this process beginning here with Melpomene. 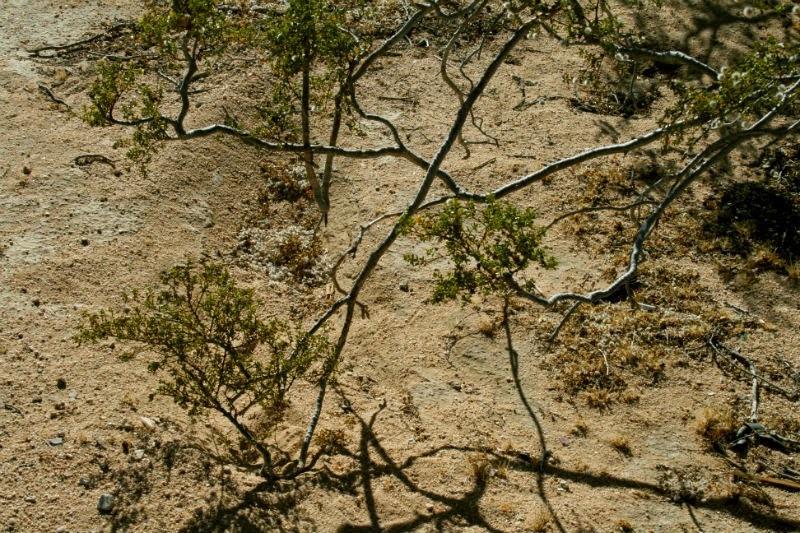 If the burrowing becomes a trend her outer branches, aided by the inevitable spitting of her crown, will be undermined and they will drop, remaining either alive or dying and in either case catching and holding organic materials blown across the desert, and providing cover to small animals who will shelter under them, leaving offerings of their own and perhaps digging more burrows to catch and hold more water when it comes. and animal droppings and other detritus directed into the hole. I have named the following larrea Cleo, after the muse of history. You can see that though her aspect is horizontal, her outer branches have dropped and her central branches are beginning to grow upwards. Cleo is a favorite of the house finches, being closest to their nest. The finches have removed the bark from some of her branches leaving them to whiten in the sun. Cleo has many snags that serve as perches for the finches who gather and consume her seeds. I wonder if this whitening of the branches allows the finches access to her seeds without getting oil and soap from the leaves of living branches on their feathers. Or perhaps I’m wrong and the transferred oil and soap protect or serve the finches in some way. The lower branches are the deepest green. These are newer leaves, saturated with the strong chemicals that discourage the browsing of hungry rabbits and previously sheep, cattle, burros and others. 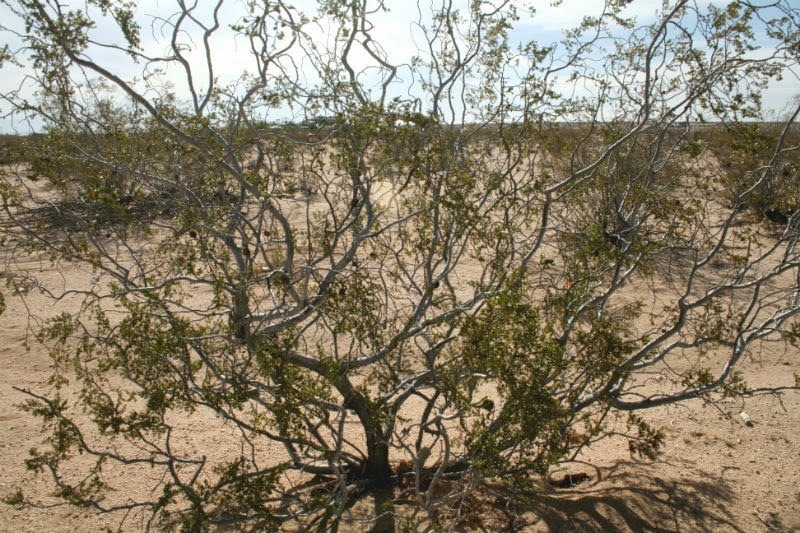 When animals do eat creosote, which is not often, they prefer the upper leaves in which the concentrations of chemicals has dissipated. 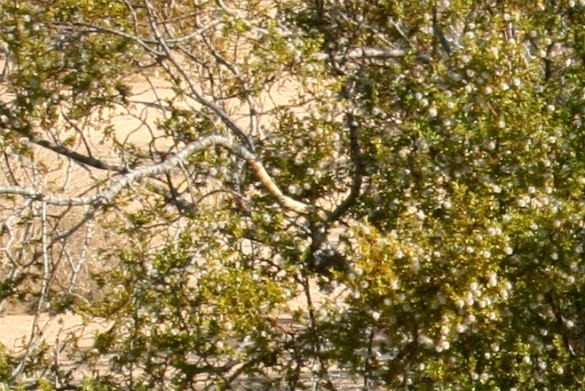 Because of the lower branches, the upper remain out of reach to small animals. The upper branches bear the flowers and seeds available to the bees and birds, and later when they fall, the ants who will take the seeds deep into the earth. These are just some of the things I’ve noticed about larrea trees, which I imagine more as communities than as independent plants. And now, when I look across this arid forest I can distinguish the plants, one from another, and spot aberrations that make me wonder about their purpose and marvel at their effect. I consider adaptive processes that I map back to my own human life and community in this unique and demanding environment.